MEMPHIS, Tenn. - Police say a 15-year-old boy has been arrested in connection with a parking lot attack caught on video in Memphis, Tenn.
Memphis police said Monday that the juvenile has been charged with aggravated assault and aggravated riot in the fight Saturday night outside a Kroger grocery store. Police said a group of teenagers attacked a 25-year-old customer as he left his car to enter the store. Police say two Kroger employees, ages 17 and 18, were knocked unconscious as they attempted to stop the fight. The suspects fled, and the three injured people were treated on the scene. 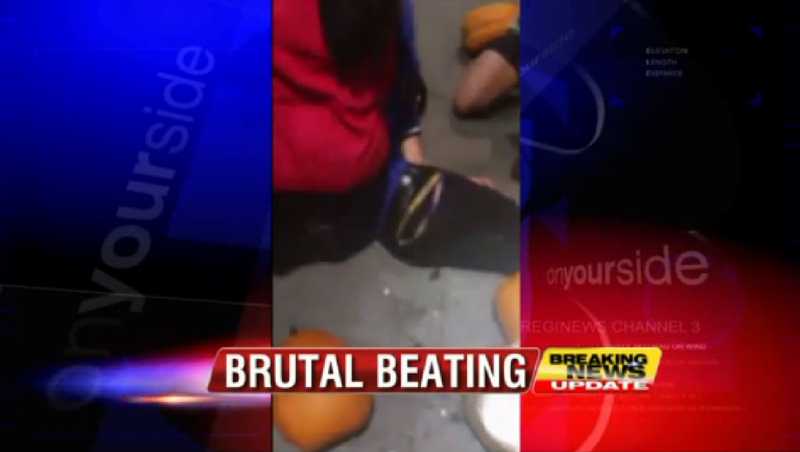 The injured teens told police pumpkins "in excess of 20 pounds" were thrown on their heads while they were on the ground, reports CBS affiliate WREG. A security guard eventually stopped the attack, which was captured on video by a store employee. Police did not name the juvenile who was charged. Three other potential suspects have been detained but not charged. Authorities have said those involved are believed to be part of a gang, according to WREG. Memphis Police Director Toney Armstrong called the incident "troubling." "Last night's events clearly demonstrates a lack of parental controls and if warranted these parents will also be held accountable," Armstrong said Sunday. Anyone with information on the incident is asked to contact authorities at (901) 636-3214.